Fri., Aug. 24, 2018, 9:57 a.m.
ROME – Many of the 150 migrants stranded aboard a coast guard ship for a ninth day began a hunger strike Friday out of frustration that Italy won’t let them disembark in Sicily unless fellow European Union nations first pledge to take them, authorities said, in the latest standoff provoked by Italy’s anti-migrant interior minister. “They can do whatever they believe,” Interior Minister Matteo Salvini tweeted, shrugging off the development that migrants were refusing meals aboard the Italian coast guard vessel Diciotti. 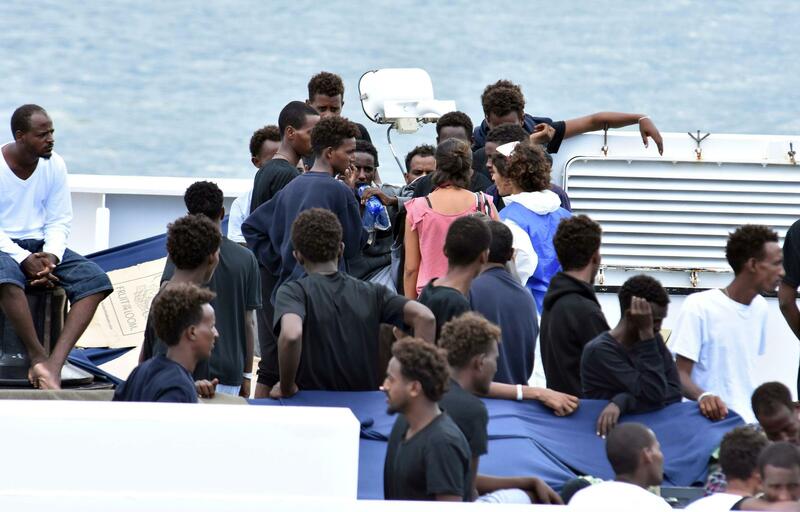 The ship rescued them on Aug. 16 from a foundering human trafficker’s boat in the central Mediterranean, and for days now has been docked in the port of Catania, Sicily. Another opposition lawmaker who went aboard Thursday expressed particular concern about 11 women, some as young as 19 or 20, still there. Di Maio threatened that Italy could withhold some of its yearly $23 billion contribution to the bloc if EU nations didn’t make good on promises earlier this year for more solidarity toward the Italians, who have seen more than 600,000 rescued migrants brought to Italian shores in recent years. A meeting in Brussels on Friday of lower-officials from 12 countries, including Italy, was grappling with how to share the migrant burden among EU members. The meeting wasn’t called to deal with the Diciotti standoff, but was expected to discuss it. Raf Casert and Lorne Cook in Brussels contributed to this report. Published: Aug. 24, 2018, 9:57 a.m.